New Winter 2018: Featuring design that is very authentic, these sports ornaments personalized from Russell Rhodes show support for individual players or build team spirit by ordering one for each. The moves like lighting lacrosse boy personalized Christmas ornament features an athlete, stick raised, ready to shoot or defend. Our excellent selection of personalized sports ornaments includes more lacrosse players and athletes from most other sports to give you multiple options for your gift giving. If this is your choice, we’ll add the custom details you provide. They’ll be hand-lettered in a stylish font to create a decoration that will look great anywhere. 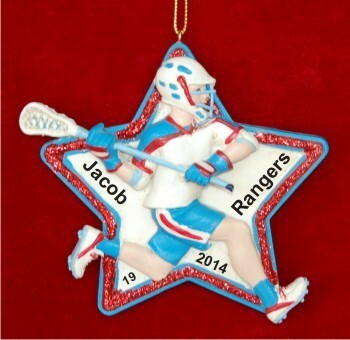 There’s room on the reverse side of the lacrosse player male personalized Christmas ornament for a longer sentiment, at your option.